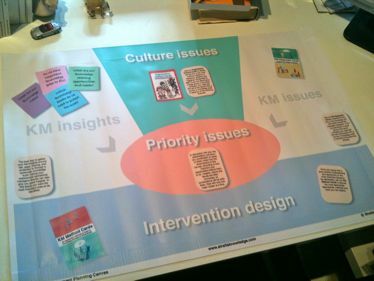 This 790mm x 540mm plastic washable table top canvas is a discussion and planning tool designed to structure planning and brainstorming sessions for knowledge management intervention design. The canvas supports participatory planning on a department by department basis, or for an organisation as a whole. Use a knowledge audit or survey to find out where the important knowledge gaps, risks, and sharing opportunities are. The central zone of the canvas is where you place the most frequently encountered behaviours, using our Organisation Culture Cards or other summaries of the culture factors (eg using sticky notes). The most frequent signals of Knowledge and Information Management needs are represented using our KM Diagnostic Cards or other evidence you have of KM needs, using sticky notes. In a facilitated group session with your stakeholders, ask them to pull down the most important group of issues into the priority discussion zone at the centre of the canvas. Then when the nature, scope and importance of the issues are fully understood and agreed, work with our KM Method Cards to agree productive interventions to meet the needs. If you want to buy the full toolkit with our three sets of cards and save money, choose our KM Planning Toolkit with a special bundle price. Watch a video on how to use the KM Planning Canvas!